The tour began in 1993 with just a few homes participating, but has grown to include 60 homes on North 8th and 9th street. The homes are decorated with life-size Santas, angels, toys, carousel horses and Christmas themed figures. 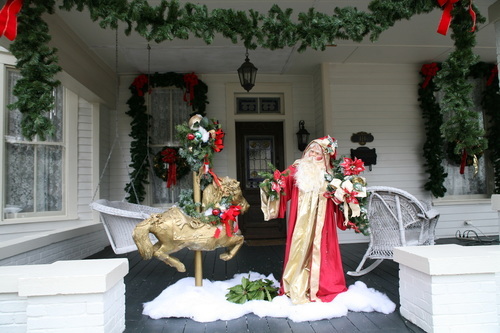 The Victorian Front Porch Christmas Tour has been voted one of the southeast's top-rated tourism events and featured in Better Homes and Gardens and Southern Living. The event is a self-directed driving tour. However, on Saturday night North 8th and 9th streets will be closed to traffic to encourage visitors, neighbors and friends to stroll through the neighborhood. This enables everyone to leisurely enjoy the homes up close, listen to the carolers, and talk with residents dressed in Victorian costumes. This tour begins on North 8th street and 2nd Avenue and includes over ten city blocks. Admission to this spectacular production is free. On the Friday night of the tour, the City of Opelika sponsors Christmas in a Railroad town which includes wagon rides through the Victorian Front Porch Christmas tour which includes tour guides who take you back in time while enjoying the festively decorated homes. The tour began in 1993 with just a few homes participating, but has grown to include 60 homes on North 8th and 9th street. The homes are decorated with life size Santas, angels, toys, carousel horses and Christmas themed figures. The Victorian Front Porch Christmas Tour has been voted one of the southeast's top rated tourism events and featured in Better Homes and Gardens and Southern Living. The event is a self directed driving tour. However, on Saturday night North 8th and 9th streets will be closed to traffic to encourage visitors, neighbors and friends to stroll through the neighborhood. This enables everyone to leisurely enjoy the homes up close, listen to the carolers, and talk with residents dressed in Victorian costumes. This tour begins on North 8th street and 2nd Avenue and includes over ten city blocks. Admission to this spectacular production is free. 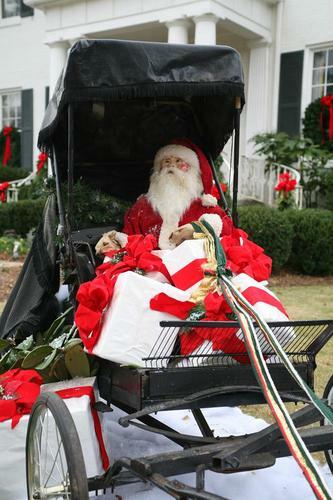 On the Friday night of the tour the City of Opelika sponsors Chirstmas in a Railroad town which includes wagon rides through the Victorian Front Porch Christmas tour which includes tour guides who take you back in time while enjoying the festively decorated homes. Opelika is located in the The Piedmont Region of Central Alabama. Be sure to check out places to Go, Eat, Stay, and other events in Opelika.